International students who are not European Economic Area (EEA) or Swiss nationals will need to apply for either a Student Tier 4 VISA or a Student Visitor VISA before coming to study in the UK (Visitor's VISA are acceptable only for a short-term course). If you are an adult and you want to undertake a short course of study in the UK (such as a beginner’s English Language course or a work-related training course), you might be able to come here as a student visitor. Student visitors are allowed to come to the UK for 6 months (or 11 months if they will be studying an English Language course). You cannot extend your stay beyond this period. In the event of being refused a visa, a student can either re-apply, apply for a review or appeal and defer their course to the next semester or request a refund in case if they do not wish to continue the procedure with our college. In order to apply for a refund the student must provide with the original or attested copy of the visa refusal letter along with an application requesting the refund. In all instances the refund must be applied (giving all the requested information) within 10 working days of the refusal. Failure to do so may result in NO REFUND. Please note: A £150 administrative charge will be deducted from the amount paid, together with a any bank or payment handling / charge. All international students must present a proof of their finances to ensure their affordability for the course and life in the UK. The living expenses / maintenance has been declared by the UK Border Agency to be £1000/month for students studying in London and £800/month for students studying outside London. These living expenses may cover accommodation rent, travelling, food and communication charges etc. Please note that the maintenance amount does not include tuition fees. The fees has to be paid separately to the college. If you are on a student visitor visa you may not be allowed to register with the National Health Services. We recommend you to buy Health Insurance (covering the period of your stay and travel to/from the UK) before you travel. Upon enrolment, other eligible students will be issued with a NHS introductory letter which will allow you to register with a local GP (General Practitioner) who will register you under the UK NHS care scheme if you qualify. For further information, please visit: www.nhs.uk. Upon enrolment you will also be issued with the bank introductory letter which will enable you to open a bank account. The college does not provide accommodation to the students on its own. However, we can provide contacts of the local estate agents or contact them on your behalf. Upon your enrolment we will provide you with a letter to confirm you student status and confirmation of enrolment at Winsor Education for the purpose of being issued with a National Insurance Number. A National Insurance Number is a requirement under the UK Law for the purpose of Taxation. If the UK Entry Clearance or Residence Permit (“visa”) in your passport (or on your identity card) contains the statement: “The holder is also required to register at once with the police” or “Register with police within seven days”, you should register with your local police station within 7 days of your arrival. Students from European Union countries are allowed to work without any restriction. If you are a member of one of the new member states (except the Republic of Cyprus or Malta) working in the UK may be subject to the Accession State Worker registration Scheme. For more information please visit http://www.ukba.homeoffice.gov.uk. Students at Recognised Bodies (universities) will retain their right to work 20 hours a week part-time and to do work placements where the study : work ratio is 50:50. Students at publicly funded FE colleges will continue to be able to work 10 hours a week part-time. Other students will have no right to work part-time and work placements will have to be 66:33 in favour of study : work. Student attendance is expected to be 100% for all classes and timetabled activities. All international students (from non EU/EEA countries) are obligated to attend a minimum of 80% of their classes in order to comply with United Kingdom Immigration requirements. We consider it as our duty to report any student whose attendance drops below the required percentage. Any absenteeism due to mitigating circumstances must be evidenced. Once the student accepts the offer and wishes to proceed with the admission, the enrolment procedure starts there and then. For International students the enrolment process also starts once they have successfully obtained Entry Clearance to enter or Further Leave to remain in the UK. As a policy all students must enrol with the college once they have successfully fulfilled all the admission formalities including registration. The enrolment will allow the students to gain access to the college facilities including computer lab, library or other learning and leisure resources and online portal etc. The students will also be issued with the College ID card and relevant letters that may enable students to register with the GP or to open a bank account or to gain Council tax exemption. The current system of enrolment allows only face to face enrolment of the student. The students must enrol before the latest start date mentioned on the Admission / CAS letter. The enrolment process takes place with the Admin officers who would verify the originality of all the documents that you submitted at the time of your application. All original documents including your ID must be provided at this time. Your details will then be updated on the database and your account will be activated for future use. You will be asked to cross check your details on the system. 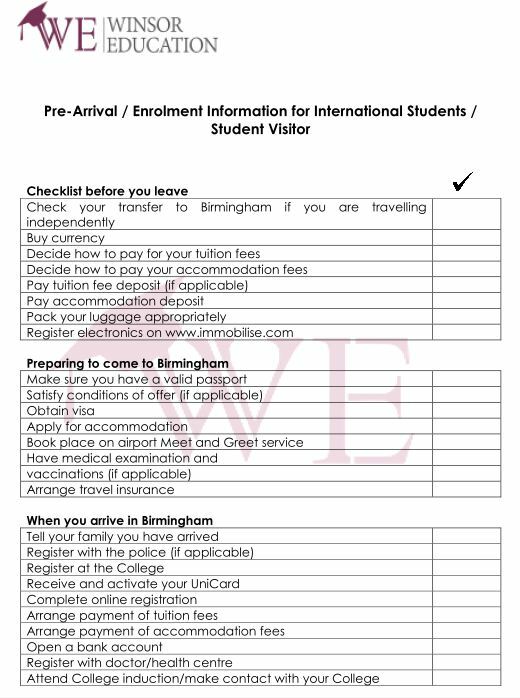 You are advised to use the following checklist for your easy journey.